We meet up in the spa, four women ready to tackle the mountain. We introduce ourselves to each other other and to Marla, the spunky petit blond who’s our guide on this fitness excursion into the great outdoors. So begins my visit to the Four Seasons Scottsdale at Troon North, an oasis of luxury in one of the Phoenix Valley’s most beautiful natural settings: Pinnacle Peak. Who wouldn’t want to work out when your view is this— the springtime desert in bloom?! There’s good reason this area’s been nicknamed the Valley of the Sun. You can count on it—warm weather, and sun, lots of it. Having just escaped winter in Chicago, I’m grateful for the vitamin D. I’m also giving thanks for the splendid desert landscaping throughout this secluded resort. 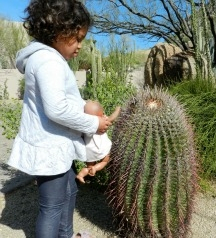 Here’s my 4-year-old daughter taking baby steps with one of the resort’s cacti. 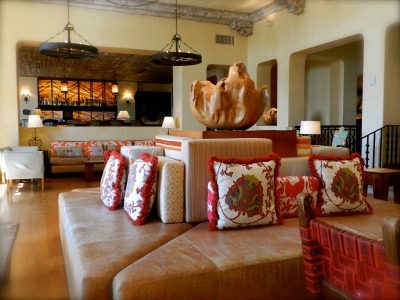 The Southwest is celebrated inside the resort as well as in the gardens. 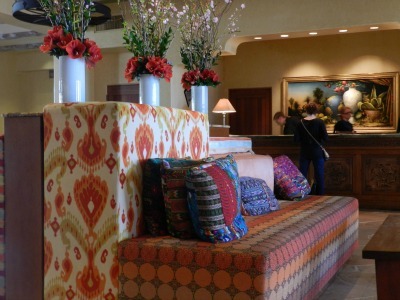 We’re not talking kitschy kokopelli, but elegant furnishings and fabrics that reflect the desert and Native American influences. The recently renovated lobby serves as the hotel’s public living room— inviting guests to sit and relax, whether in front of the fireplace or at the bar. The use of colorful fabrics is striking, yet soothing. 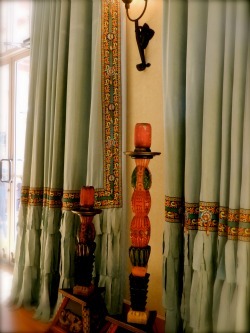 Take a peak at these beautiful beaded curtains— casual, yet so elegant. After that, it’s time to grab my book and relax in one of the complimentary pool cabanas, breaking up the chapters with an occasional hop into the pool, kept at a perfect 85°. 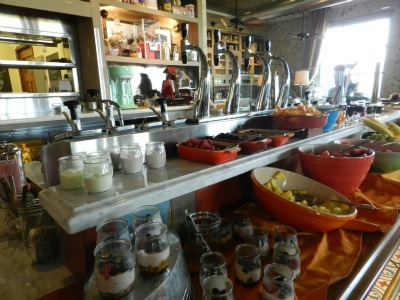 Of course, none of this would be possible without the Four Seasons fantastic Kids for All Seasons kids club. 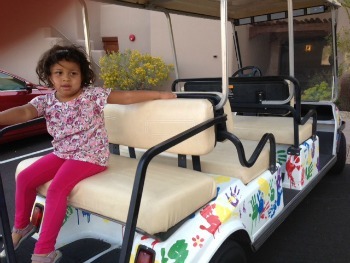 We grab the kids club golf cart for the short ride over to where friendly fun-loving adults greet my daughter. I’m relieved that they don’t just spend the whole day inside watching movies and playing video games. Instead, counselors take kids on excursions around the resort. One day they make a sun catcher, another day there’s a treasure hunt and wacky outdoor games. 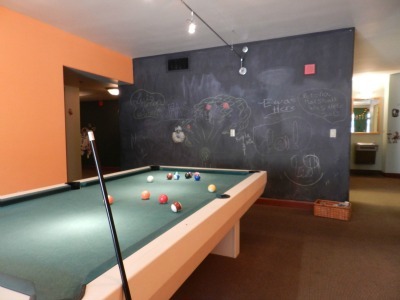 Once the kids need a break from the sun, they’ve got plenty to do inside as well, including movies in their own theater and plenty of games. The resort’s family-friendly restaurant, Proof, resembles an old-fashioned soda shop, blending a perfect balance of Americana kitsch with modern amenities. The restaurant honors the pioneering spirit of the west with archival photos of Arizona, Route 66 and steam locomotives. The transportation theme inventively makes its way into the decor. 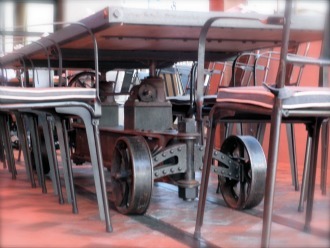 Loved the menus made of license plates… and check out these tables, made out of train push carts. There’s a sweet welcome when guests arrive— prickly pear iced tea. 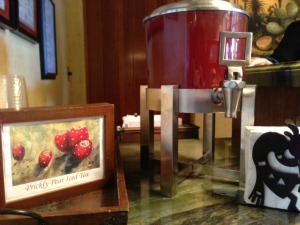 That’s right… tea made from the juice of the prickly pear cactus. We found ourselved returning daily (okay, throughout the day) for this uniquely Arizona iced tea. They also serve an awesome adult version of this drink— the prickly pear cocktail. I’ve heard of farm-to-table, but farm-to-glass?! 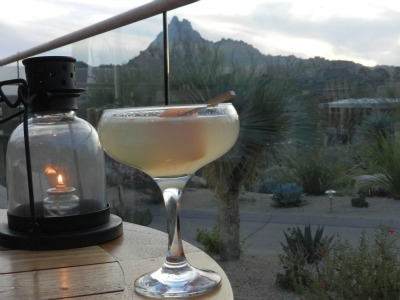 It’s a creative concoction you’ll only find at the Four Seasons Scottsdale. Cheers! My two boys, ages 12 and 14 are big baseball fans. 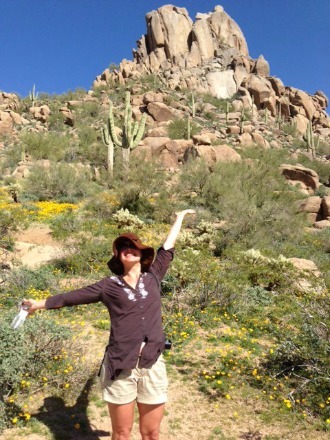 Visiting Arizona in March means we’re hitting the diamonds… and I don’t mean shopping for jewelry! Half of the MLB teams train in the greater Phoenix area. On any day in March, you’ll have several different games to choose from. We had a ball spending an afternoon watching the Chicago Cubs at Hohokam stadium in the nearby town of Mesa. Tickets to spring training are less expensive than regular season games, ranging from $6 to $40. Combine that with the opportunity to see your favorite players up close and get autographs, and you’ve scored a home run. Another great nearby activity is visiting Taliesin West, the winter home of modernist architect Frank Lloyd Wright. Wright believed in using local materials, so you’ll feel a real connection to the desert as you tour this home and architectural school. Sports, culture, great weather and ample opportunity to enjoy the great outdoors. We’ve found our place in the sun.